In March, H.R.1823 - Marijuana Revenue and Regulation Act was introduced in the House of Representatives by Rep. Carlos Curbelo (R-FL) and Rep. Earl Blumenauer (D-OR) and in the Senate by Sen. Ron Wyden (D-OR), Sen. Rand Paul (R-KY), and Sen. Michael Bennet (D-CO). The bill, as proposed, would establish a federal tax on all legal sales of cannabis in the United States. The tax rate would begin at 10% on retail sales of cannabis in 2018 and increase to a maximum of 25% five years after implementation. 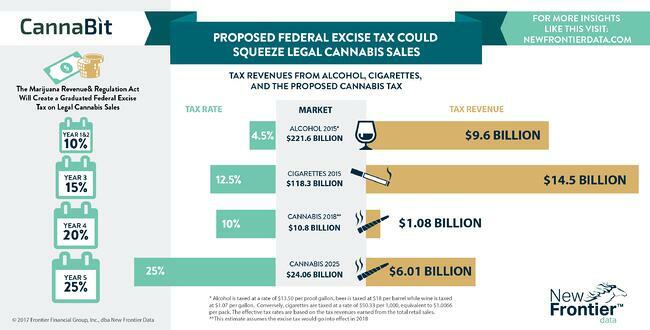 Growth potential for the cannabis industry may be severely limited by these tax rates as it could increase the retail price of cannabis significantly. States like Washington, which already imposes a 37% state excise tax on cannabis on top of state sales tax and local taxes, would see the total tax rate on cannabis exceeding 60% under the proposed bill. The proposal of a federal tax on cannabis is a positive development for the industry in the push for national legalization. However, a new tax not harmonized with existing state-level taxes might lead to a resurgence of the illicit market as consumers seek cheaper alternatives.